First and foremost I would like to congratulate my students Enrico “The Eliminator” and “Big Fish” Byron, who took my beach fly fishing course two years ago, for the success they are having this year. Their dedication and obsession has resulted in both having caught over 20 coho each and some pinks this year already. Before this season, they had hooked maybe one or two fish. It is a joy for me to see this, as it is the hardest fishery that I know of locally. Enrico with yet another fish! Last week was amazing fishing, hooking numerous fish. 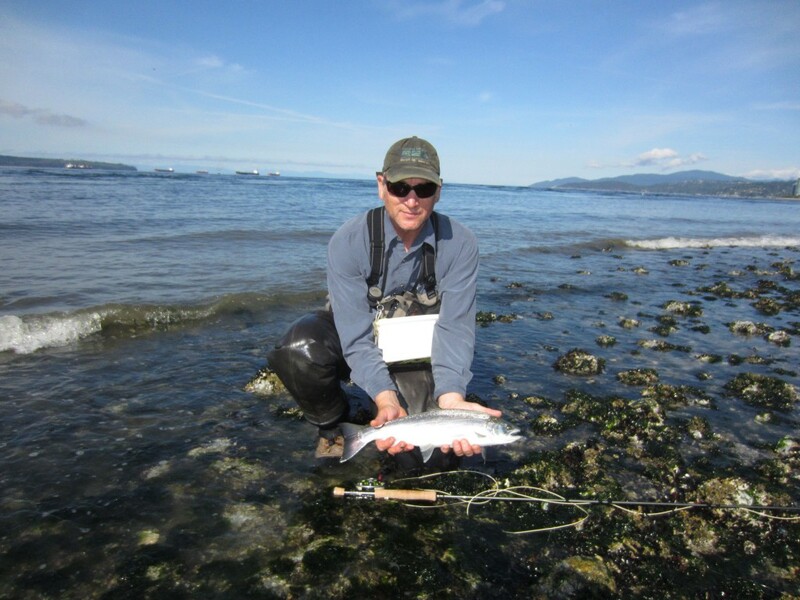 This week the tides are low in the afternoon which can make fishing challenging, but don’t be discouraged as it is possible to catch coho on a bright sunny day and maybe it will cloud over. When fishing on a bright day try using brighter patterns like orange and white and on overcast days or at dawn use chartreuse and white to start. Vary your strips from super slow long pulls to moderate strips to find which one works for that period of time. The behaviour and the mood of the fish changes periodically as the tides vary. From July 24th the tides are in our favour again to fish off the beach. Until then use of a floatation device can put you closer to these fish. There are also pinks hanging out at Ambleside before they head out their way to Indian Arm. This pink was caught recently after two coho on a guided trip. Furry Creek continues to be really good with huge schools of pinks as some of them are already in the river. You can start fishing Furry Creek at any time of the day, as there is no shortage of fish especially if you are gear fishing with spoons or buzz bombs. It is best to fly fish for pinks going into low tide and a couple of hours after, as it is easier to cast your fly to them. Happy fishing and see you on the beach. 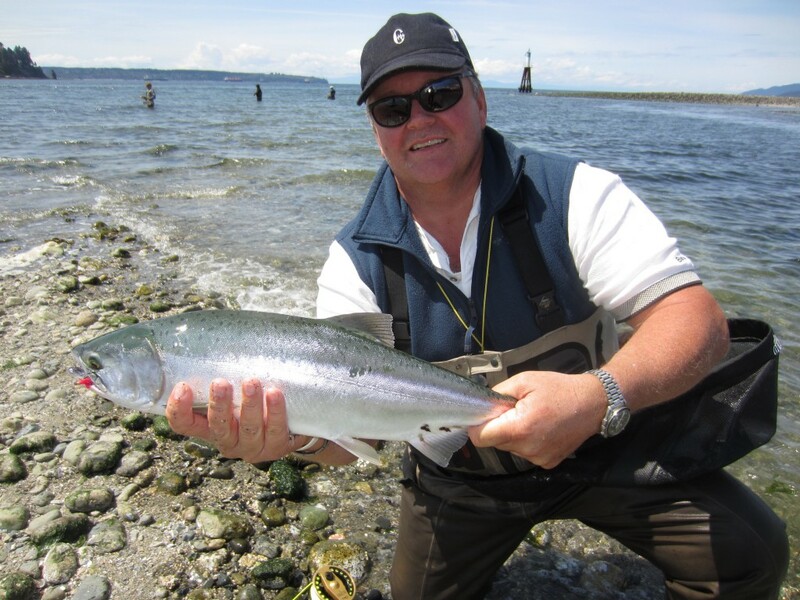 The good coho fishing continued this week, although later in the week there were some strong winds that made fishing difficult and the large tides also slowed down the action a bit. That being said, even on the slower days we were doing pretty good, we just got spoiled earlier in the week with triple headers and even some quads! The mix has been about 70% coho and about 30% pinks for the most part, but it depends on what you are using. 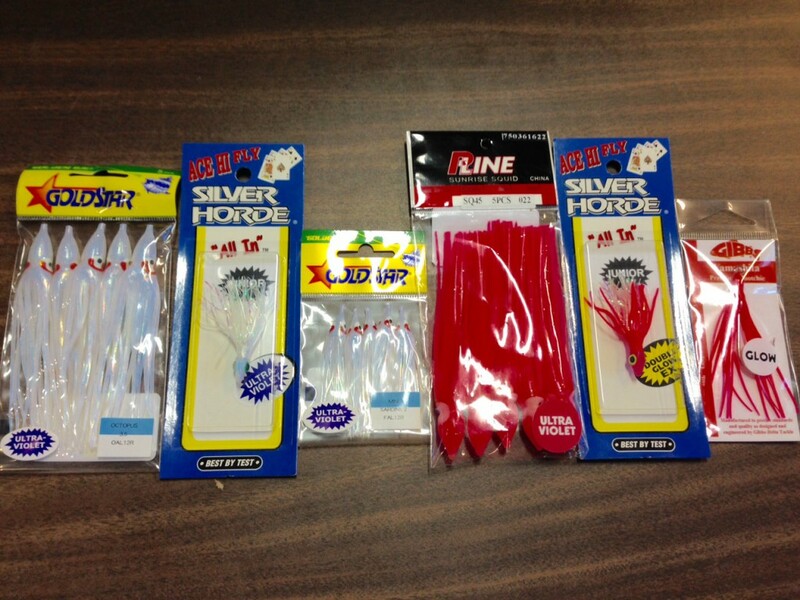 We have been using white UV hootchies and small spoons for the coho. The fish this week have had some really small bait in their stomachs, hence the productive catches on smaller spoons, like 3.0 Kingfishers and 2.5 Pescas. The mini hoothcies were also producing well this week for the same reason. It should be noted that there are good numbers of pinks around and if you put on a pink hootchy you can expect some good fishing. I was talking to some anglers earlier in the week who were well into the double digits for pinks off W. Van by trolling small pink hootchies. The white UV hootchies tend to work well for coho and you will get some pinks, while the small pink hootchies will really crank up your production for pinks, and you will often get a few coho on them as well. We expect the fishing off W. Van to only get better as more and more cohos and pinks show up over the coming weeks and stack up off W. Van as they can’t get up the ultra low Capilano and Seymour Rivers. 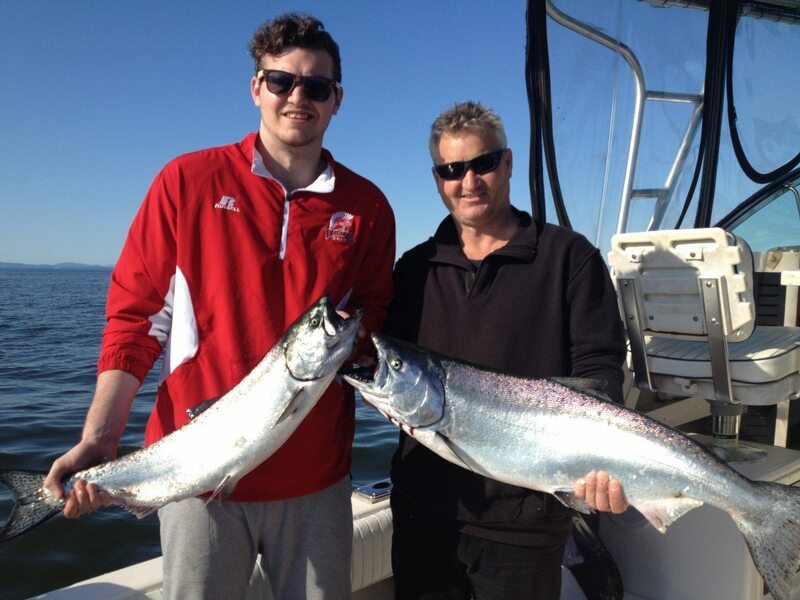 There have been some nice Fraser chinook caught by anglers fishing the Bell Buoy area as well. This is typical for this time of year and the numbers get better as we get later on into July and August, so start fishing this area now and for the next 6 weeks. The usual tactic is a glow flasher and an anchovy or herring in a glow teaser head on a 6 foot leader from your flasher. The glow is usually key because the water is dirty and there is not a lot of light penetration. This year the water has been much cleaner than normal because the Fraser freshet was so mild. In this cleaner water there is a lot more visibility and the non glow flahsers and chrome teaser heads have been working well. The UV Jelly Fish Kinetic Yellow Green Mist has been hot. If you don’t have this one in your tackle box yet, it is a must have for coho and for chinook and is a guide favourite. Other productive flashers have been the Silver Betsy and the Gold Betsy as well as the Green Haze and Purple Haze. All of these flashers have been great in the relatively clear water off W. Van for coho and pinks and the cleaner than normal water off the Bell. Hot depths at the Bell have been from 45-80 with most of the action in the 50-60 range but on a few days we were hitting fish a little deeper, down around 70-80, likely due to the clean water and sunny conditions. 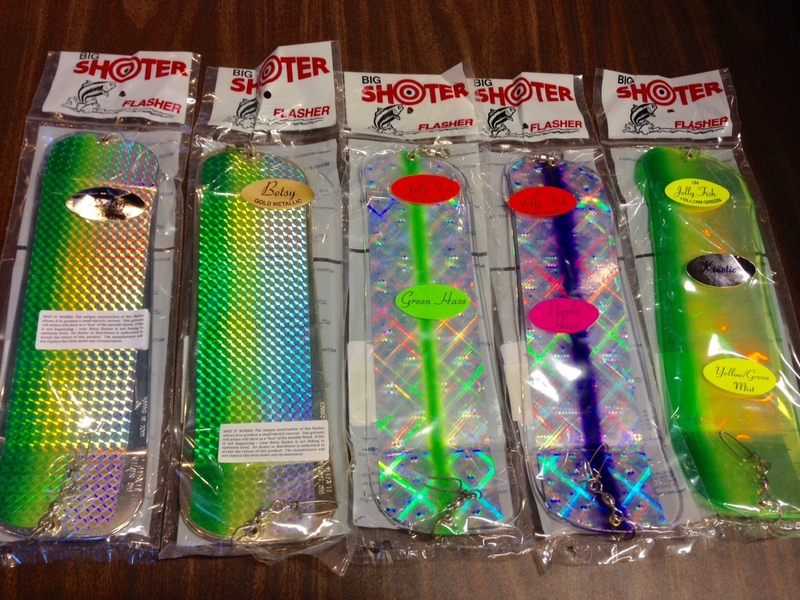 These have been hot flashers lately in the clear water we are fishing this summer season. From left to right, Silver Betsy, Gold Betsy, Green Haze, Purple Haze, UV Jelly Fish Kinetic Yelow Green Mist. These 2 chinook were caught on one of our guided trips Sunday afternoon after a productive morning of coho and pink fishing. These fish were hooked at 47 feet and 67 feet on the UV Jelly Fish Kinetic Yellow Green Mist flasher and a chrome green chartreuse teaser head and UV green haze teaser head. 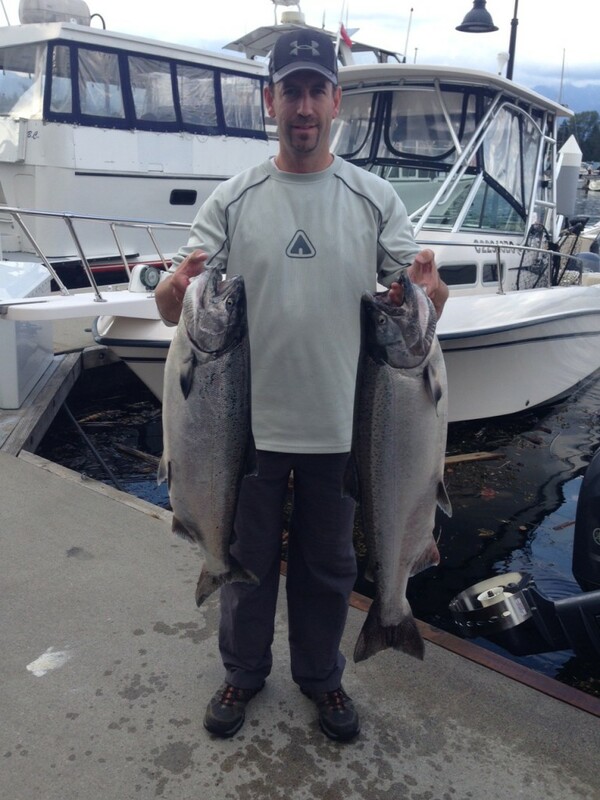 Two nice chinook landed this week. We have to mention the slab that Eddie caught last Friday off the Bell Buoy as well. As it was caught on a charter on Friday morning, it didn’t make the Friday report last week. This was 1 of 4 chinook that were landed on that trip and another 3 were lost. There was definitely a good number of chinook off the Bell that Friday, but the weekend was a lot slower. Such is July chinook fishing off the Bell, here one tide change gone the next. 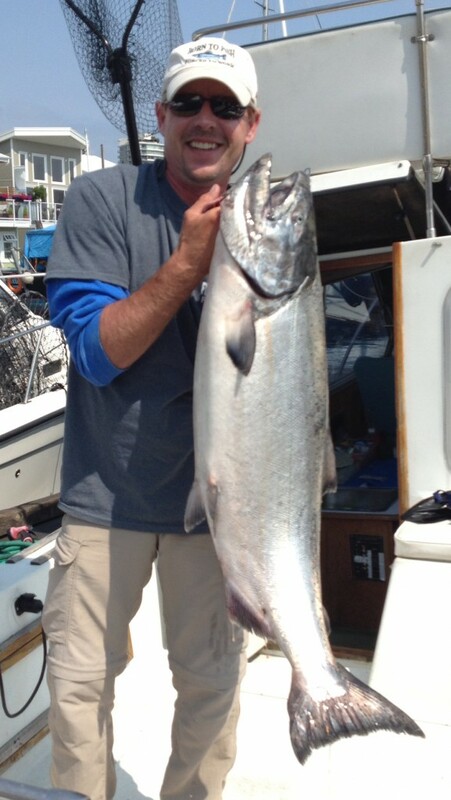 Captain Eddie with a nice chinook that tipped the scales at 33 lbs!